Mae llyn hen i’m llawenhau. The focus of the social life of the poets and patrons was the feast, where plenty of food and drink was available. According to the Law of Hywel Dda, special feasts were held three times a year, namely at Christmas, Whitsun and Easter. Saints’ days were also occasions of celebration, especially in the abbeys. During such large feasts special officers were employed to make the domestic arrangements of the feast. Praise of patrons for their generosity and hospitality had been part of the bardic tradition for centuries, but the feast became a particularly important symbol of wealth and status in the later Middle Ages. Indeed, although it was a social activity full of enjoyment and delicacies, exhibiting wealth and status was the main purpose of a feast. 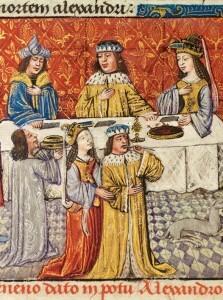 A reference to a feast is frequently coupled with a reference to gold or the donation of gifts which were a further visible sign of the patron’s generosity. The main function of the poet was to make known this wealth and spread the good name of his patron.